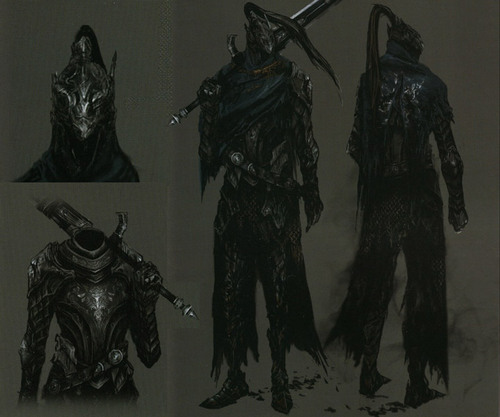 There is a possibility that he was present during the fall of New Londo as he traveled there when the Four Kings fell to the dark and hunted the Darkwraiths. To do this, he made a covenant with the beasts of the Abyss (possibly Kaathe or Frampt) that allowed him to traverse it. When Oolacile fell to the dark, he was awarded the Silver Pendant for facing the Abyss, an ancient treasure of Anor Londo that "deflects the Dark of the Abyss, especially in its magic forms". He traveled to Oolacile but was defeated by Manus. Artorias sacrificed himself to protect his wolf companion, Sif, using his greatshield to raise a barrier around the pup. He fled from Manus, but his exposure to the abyss overcame him and he fell to its corruption. 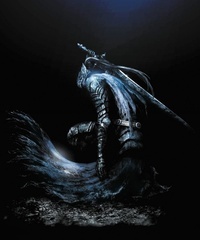 By the time the the Chosen Undead arrives, it is too late; Artorias is by then completely overtaken by the corruption of the Abyss and attacks the player. Whatever thou art, stay away. Soon, I will be consumed. By "Them", by the Dark. I beg of thee, the spread of the abyss, must be stopped. 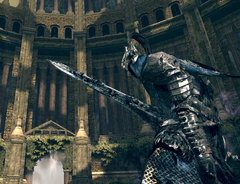 Soul of Lord Gwyn's Knight Artorias, who was consumed by the Abyss. The legend that Artorias repelled the Abyss only told half the story. It seems that he was defeated, and his honor preserved, by some unsung hero, who is the true victor of the Abyss. This ring symbolizes Knight Artorias's covenant with the beasts of the Abyss. This door leads to the grave of Sir Artorias the Abysswalker. This greatsword belonged to Lord Gwyn's Knight Artorias, who fell to the abyss. Swallowed by the Dark with its master, this sword is tainted by the abyss, and now its strength reflects its wielder's humanity. Helm of Artorias the Abysswalker, one of Gwyn's four knights. One of the ancient treasures of Anor Londo. Presented to Artorias for facing the Abyss.